With an enviable location, a few steps from Concorde Beach and La Caracola Beach, the Wyndham Concorde Resort Isla Margarita is the ideal place to enjoy your 5 star vacation. Our guests can stay in any of our 248 luxurious and spacious rooms all with sea view and equipped with all the amenities, as well as enjoy our restaurants bars, room service 24 hours a day. You can also relax in the giant multipurpose pool with its beautiful terrace and solarium, and enjoy a refreshing cocktail in our wet bar without having to get out of the water. 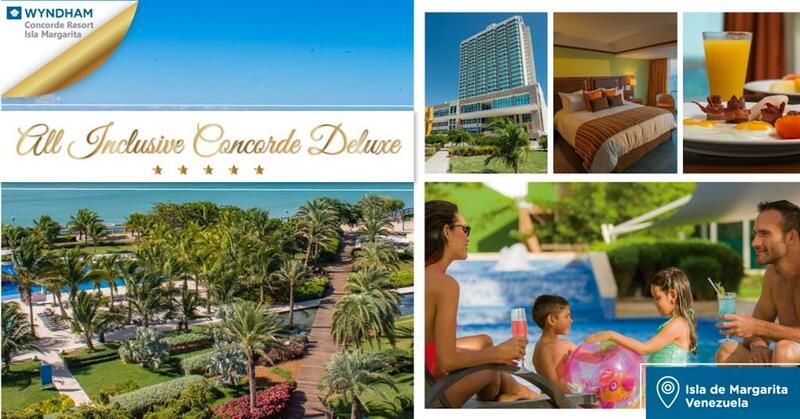 For the comfort of our guests, the Wyndham Concorde Resort Isla Margarita has free Wi-Fi in all rooms, lounges and public areas, taxi service to the airport 24 hours a day, free parking and the services of our always attentive , bilingual staff at reception. Much more than good service, personalized attention! The service and attention of international category distinguishes us and makes our guests feel very close to home. Our rooms convey harmony and comfort. We take care of every detail to make your stay a full and complete experience. With easy, direct access to one of the BIGGEST Shopping Malls in Margarita, Sambil Mall - This is your ultimate destination Boutique Hotel. In the heart of Playa el Agua, our luxurious Margarita Island hotel combines modern elegance with a magnificent setting on one of the island's best beaches. You can swim in the pool and jacuzzi complex and relax in front of the Caribbean Sea. Our elegant restaurants and meeting spaces are ideal for organizing events and enjoying a real land cruise. 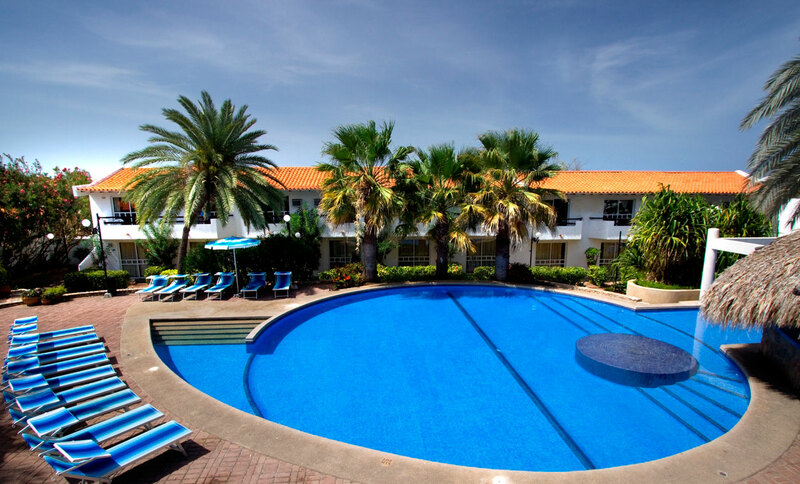 The Hotel LD Suites Punta Playa is located in the fabulous Pedro González Valley. It is a perfect new concept to vacation with trained personnel to provide the highest quality services in the international hotel industry, offering a wide variety of fun and entertainment alternatives. 120 Luxurious Suites of 2 and 3 rooms and 92 Queen and Twin rooms with views of the sea and the Golf Courses. Unik is a city hotel, minimalist with a lot of style and good taste. It is a perfect harmony of luxury and nature that provides a unique hospitality. Sensations of relaxation melt in this intimate and eclectic place, ideal for those who live with passion and those who make business a pleasure. The Hesperia Edén Club hotel is located on a 3km-long beach on Venezuela’s Margarita Island – known as ‘the Pearl of the Caribbean’. Away from the sands, it’s about half-an-hour to the shops of Porlamar. At this exclusive, adults-only hotel there are 139 rooms – all of which were renovated in 2012. They’re light, spacious and comfortable with tiled floors. This resort offers within its facilities facilities including three swimming pools surrounded by exotic gardens with a palm grove, along with the jacuzzi and pools waterfalls. Four buffet restaurants with all-inclusive service, and a specialty restaurant with a la carta. Seven bars, where you can enjoy colorful cocktails prepared on the spot. Palm Beach Hotel is located in the Heart of Playa el Agua, privileged area of our Margarita Island, the best place to enjoy and make of your holidays unforgettable days, surrounded by beautiful Gardens, Pool, Jacuzzi Masajes, Music, Games, Bar, Restaurant, Beach Club and others services, that complement our All Inclusive Plan, and will make your stay an everlasting memory.